Amelia shows what a tremendous impact a wondeful buck like Jacobs Pride Cloud Chaser has had on our herd. Amelia easily acheived her MILK STAR in her first lactation. She excels in general appearance and body capacity. She has one of the most gorgeous heads in our herd and ears that go FOREVER ! As a 4 month old junior, Amelia was Reserve Grand in a very large junior class. Her udder is well attached with beautiful shape & soft smooth texture. When she first freshened we could see she had all the makings of a show champion with another lactation or two. In 2012 she got 2 legs toward her permanent Championship, but made us wait until 2015 to get her final leg. However, she did it in "Latte Da" style by also going BEST DOE IN SHOW ! 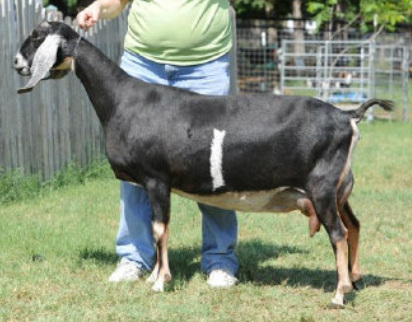 This made her the third Chase daughter/son to get a CH in our herd. Her daughter Latte Da Flight of Fancy (a Star Status grand daughter) is still in our herd and has a promising career ahead of her. Amelia is milking through on her final lactation and will retire when she is ready!